Newman's Annihilator | THERMO Spoken Here! By forklift, we quietly positioned the annihilator to enclose the fly. We put plenty of putty around the cylinder-to-ceiling contact, making it air-tight. The vacuum pump has just shut off, pressure inside is 0.0 Pascals. I'm a little nervous, we are standing under a very large piston. Al claims this tested just fine on a pesky raccoon. When Al pulls that lanyard, will the piston go UP? ♦ Al need not pull the lanyard for us to determine whether the piston will go "up" or "down." The pin restrains the piston its "loaded position." With the piston as system, if the pin is pulled the and the piston "goes up," then pin force acted downward before release. So we check "before release." 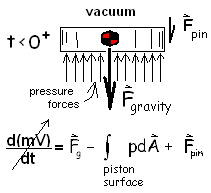 We draw a sketch, a free-body-diagram of the piston with the forces that act. Then place the forces in the momentum equation. and bottom of the piston. The piston momentum is zero because the pin restrains it. The gravity force is downward. The pressure-force of surrounding air is upward. We assume pB,bottom = patm which is constant. The pressure over the top of the piston is assumed to be zero. group on the unit vector. A good habit is not to move terms across the equality of an equation until all terms but one are numbers. Once the equation has become arithmetic, move the numbers! The direction of the pin force is downward, hence the pin is restraining the piston from moving upward. It is safe to stand under the thing and fire it. Calculate the work of the atmosphere per bug killed. ♦ Some consumers have asked people not to buy the Annihilator because it does its job too well and contributes to global warming. The sketch shows the piston in its initial and final states. The sketch shows the piston in its initial and final states. The atmosphere is a compressible gas; with any increase of volume of matter (a system) there is a payment of energy to the atmosphere in the amount its space is diminished. Next apply these limits to the integral and integrate it. Calculate the second temperature of the bug. ♦ With the piston and bug as system, assume the piston and ceiling (surroundings) are perfectly rigid, meaning no energy will pass to the ceiling or piston because of the impact. Our tool is the Energy Equation. The work of the piston is positive and equal to the work of the atmosphere already calculated. The elevation change of the piston is two meters. We expand the terms and enter that number. 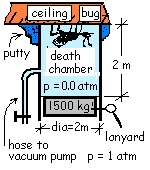 Approximate the "bug" as two grams of water with the specific heat, c = 4.2 J/g°C and initially at room temperature. The energy change of the bug (assuming it is liquid water in the second state with a temperature just less than 100°C) is written as its mass times specific heat times temperature change. Wow! Did the calculator get this number? By writing the change of the energy of the bug in terms of a specific heat, we built in the assumption that the second temperature would be less than 100°C. The answer we obtained, ~ 72,000°C contradicts our operating assumption. So in fact, the annihilator would turn the bug into vapor. Pure awesomisity... what a machine!